Israel bound I was not about to explore the newly popped artisanal ice cream shops. Creativity in this melting pot is abundant, I could imagine the flavors of the newly sprouted shops would come up with, yet still I wasn't home bound to write about ice cream and Italian gelato. That is until quite by chance I stepped into Capitolina and met Yair while roaming the flea market (Shuk HaPishpeshim) in Jaffa (Yaffo). The old mixed in with the new as the flea market is being re-gentrified. Strong opinions from vendors that have been there for generations about the new bauhauses, boutiques, galleries and trendy restaurants popping within their alleys, at the gut of their very existence. To me it is all beautiful. We arrived at 5pm for a late late lunch. Parking is scarce but we found what appeared to be a perfect one, only problem from 7pm on. The vendors were hosing down the rundown alleys and curbs preparing to close shop. One Persian vendor, and here we go with the cliche, selling rugs, was meandering about by our parked car across the alley from his corner shop. We were concerned about a whopper of a ticket. He told Jonathan to dial his cell so he has our number. An absolute stranger. While we are having lunch he will be on the look out. So we dialed and dashed off. We went to lunch to the much hyped Doctor Shakshuka. We had to do it once. A wacky establishment with tzatzkes hanging from the ceiling lending themselves to be photographed. If you are in Israel skip it and experience the colorfulness through this and other pages. If you would like to see the tzatzkes order schwarma and shakshuka but pass the mezzes. J's pet peeve was why do they serve the schwarma with thick slices of a fresh loaf of bread and not pita?! I echoed his sentiment, but as brave as I am, I was not about to utter the words and muddy the water. The waitress was a reflection of this 'Misedet Poalim' (workers restaurant) with prices more targeted towards tourist pockets. She has lived life and here in this spot she is used to the lime light. She was tough and I had to get access to the kitchen, where the cook demonstrates with a rehearesed playfulness a quick breaking of the eggs. Doctor Shakshuka himself sat with his buddies at a table nearby and once in awhile getting up all ruffled about this or another matter in the kitchen. I knew my way to the kitchen is through this waitress who exudes a nonchalant confidence so I overlooked a small matter of the scorched Shakshuka bottom. There was even an Israeli celebrity sitting at another table taking or making notes of sorts, just across, but I was a food and tzatzkes paparazzi and not at all interested in celebrities. Soon after we hurried off back to the car where we talked to the Persian rug dealer. Left again as we saw he wasn't concerned. Traffic violation reports seize after 4pm. The vendors know the in and outs and when the cops go on their respective siestas. We walked around the flea market, shuk, and took as much as we could in, there was so much bustle. It was easier as things, early evening, were dialling down. We stumbled into Capitolina and plan to go back for their sorbets. This time we ordered the Indian kulfi, which Yair says was the most challenging recipe to perfect. The original version was from this woman in India who showed him how to make it during his travels a few years back, as he put it, at 27, relatively late for Israelis. Prior to opening his first location in Kiryat Gat in 2009 (in the south), Yair traveled to Italy to study artisanal ice cream making at a small Roman family owned and operated gelateria. The Kiryat Gat location was sold to a dairy restaurant and Yair moved Capitolina a year ago to its current Shuk HaPishpeshim location. With some exceptions, such as the Lemon Pie Yair does not use egg yolks (eggs) in his ice cream bases. Yair does not compromises on the quality, he uses Belgian Callebaut chocolate, French Valrhona and Madagascar vanilla beans as raw ingredients. The nuts are lightly toasted and ground to order. The gelato made in small batches with finest raw ingredients are just to name a few more reasons why they are superior. The cherry on top was while Yair gave me a tour of the upstairs, where he churns the gelato, one of his staff members, came up complaining, about a man who keeps coming in asking for the reduced rate ice cream. She said 'you were nice to him once and now he is taking advantage'. Turns out the guy is unemployed and has many, if I am not mistaken, seven kids, so Yair absorbs the cost. So nice! ..and yeah forgot to mention Yair studied education and used to be a preschool teacher. Now living back on a kibbutz where he grew up, with his wife and two kids. While am sure there are other worthy artisanal ice cream shops in Israel, I believe I found the one I fancy the most and caters dead on to my likes. I do not play golf but I like the idiom 'a hole in one'. I usually do not post recipes with tree nuts as S is allergic but today is the exception. After receiving the recipe from Yair I understood clearly what sets Capitolina apart. Experience it for yourselves and enjoy the recipe below. The images of the falvor tags above are just some of the ones Capitolina offers. Thank you Yair for the images of the flavor tags and Capitolina's logo. Bring all ingredients to a boil, reduce to low and cook for five minutes. Let cool on counter then chill in refrigerator for at least three hours. Strain through a fine mesh sieve. Whip the mixture well with a hand held electric blender (immersion blender) on low/medium. Churn in an ice cream maker according to manufacturer's instructions. Mix in the chopped pistachios two minutes before ice cream is ready. Scoop into a container and freeze for at least few (4-5) hours before serving. Ice cream is best served the next day or within at most two weeks of churning. A divine ice cream! I'd love to visit Israel. The food there is just amazing! Shaba papparzi yep it is me. So good I hope I can go back before heading back. Be still my heart. I know I like ice cream but this is incredible. Thanks for sharing your adventures. Ken, you are so poetic. Thx and yes it is incredible. I know you would love it here. Love this first recap! That ice cream looks magical, but I'm drooling over the other food. Gosh I miss all those wonderful dishes (well, maybe not the meat... but definitely the hummus and pita). OMG Bri tomorrow am going to the best hummus in Israel in Jaffa. Whimsical captured the essence of the place. & yep we did catch what arguably is considered the best hummus in Israel in the nick of time just before we flew back. I will post about. Was really charming. Yep. It is a different method than the traditional Indian one but achieved the same flavors in a form of a gelato. Thanks for dropping by. Your photos and stories make me yearn to return to Israel and spend an inordinate amount of time discovering her food. 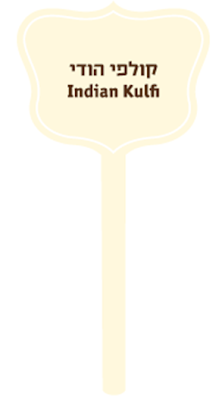 This kulfi looks and sounds incredible! Thank you for sharing the recipe but would it work without an ice cream maker?